10'4" x 28.5 x 4.1" - 140.4L - Perfomance Longboard; based off a 10'6" SURF; with some tweaks. I wasn't after a noserider at all as it's not really my style, I was looking for a "perfomance" longboard surfed off the tail like a short prone surfboard with added glide for long point break conditions up to around 1.5 x OH. I love the smooth ride, construction, look and customisation offered by Sunova so I never considered another brand. Hopefully the conditions tomorrow are good! Here's a pic of me playing around with the fin set up... I'm going to try the quad set up first. Nice looking board! Is the brown image a representation of the top of the board? Is that something like what they are planning for the Shroom? I reckon it's pretty cool that they are willing to work with a customer on such a unique design. I know there are Aussie shapers who will do that, but getting Bert Berger involved is really something! Wow - looks epic. Can't wait to hear how it goes! Thanx for your stoke. Now get that baby wet and let's see some more pics. Hoppo.... that looks freeking great! I like what you have done.... tonight I was writing about how good the 10'6 Surf performance is, and I think I would really like your board! Enjoy it and break out the video cam! Yeah, It's a 3d drawing of the deck. I have them also for the bottom and rocker, but they are not as interesting. The shroom is much more of a concave deck to make a wide board more responsive, what we did on mine was so I could have a totally flat deck. The brown pic makes it look quite deep, wheras in reality it might be 5mm deep. I took it out in absolute rubbish this morning and caught a couple of waves, and didn't fall in that much considering the conditions. I did need to keep moving however, but that will be different on calmer conditions and when I get used to it. I asked Bert will it be more stable than my 9'2" Speeed and he said in a round about way; it'll be 10% more stable. I'll say easily 10% more stable. Just from the few waves I caught I could tell straight away that this thing is gonna rock my socks off in good conditions. if you're ever downunder, around Bells, you can take it for a spin anytime! 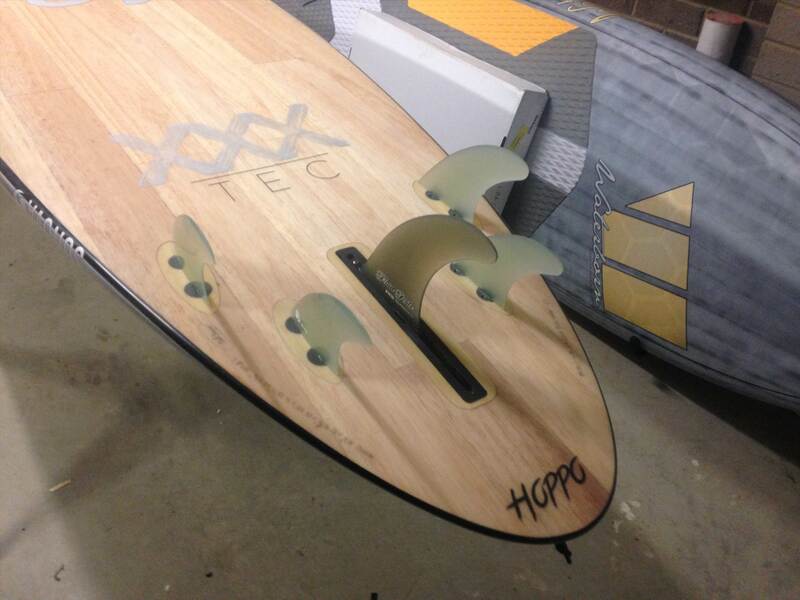 Interested in how the Hoppo custom Surf has fared. Learned anything since? Compared to 9/2, for example. Bert is just one of many shaping pros out there and I would have supported a local one if it were available. But for me the whole interchange with him on the shape, the delivery to me all the way over here and the quality of the board's construction worked out great. Here's a vid of this beauty set up with PSH quads. I've now had it for 6 months, used in varied spring / summer conditions, with different fin set ups etc. - It can be a bit tricky to stand in heavy chop (at 107kg + gear), but in smoothish stuff it's fine. - Allows me to do top turns on smaller surf and not come off the back like the 9'2" Speeed did. - It's smooth and loves speed!!! - so far works best as a 2+1 with small/med sides with a 7.5 centre - too stiff as a quad and too stiff as a 2+1 with large sides for the average conditions its been used in, havn't tried a Single yet. - would give the deck more of a dome to thin the rails through the middle more and not bother with the recessed deck. - has more drive in turns (cos of the rocker through the tail) and does not snap quite as quickly - I guess that's from the hip in the speeeds outline : but there is not much in it. Wasn't finished quite as well as the stock Speeed was; deck pad not quite on straight at the tail; slightly uneven sanding on the bottom and rails; with fins in, the carry handle isn't quite on the balance point. I'm more than happy overall and would certainly buy a Sunova again. Bert, Tino and the boys were great to deal with directly. The board does exactly what I asked it to do when we were speccing it. I do prefer it to the Speeed overall for everyday conditions. Overall finish was good but not perfect. Like to see it someday Hoppo. Wheres your favorite spot . PS. Just as far as deck grip / traction goes. I've got this stuff on the front of my Speeed and I love it. hey hoppo i might see you around the traps - i'm local to bells area too, and have picked up a custom sunova speed 2nd hand off this site at 9 5, 30 wide, quite a bit thinner and with a flatter deck than std, more rounded nose and tail v pulled in, comes in at 135 litres... have had a 8 8 speed in the past, this one is my easy fun board, using it as my longboard/ cruising sup and loving it. also think it will be great in some juice... has a US fin box and currently using 2 + 1 but will try as a single soon (agree with comments in other posts re the sunova fin boxes being loose, couldn't use a new FCS II longboard fin i bought with it as it would fall out). only been out in crap so far, lets get rid of those easterlies! Was interested to see the drawings early on and that it was based on the 10 6 Surf. Does anyone know if the Surf and Style has a similar rocker line or is the Surf a wee bit more banana like? Loved the clip. Surfing looked great, BUT, Jethro Tull. YEEEWW. Why don't more people use this music on their clips! The Style has a much more pronounced tail flip and less rocker through the front. I lost a FCS 2 Box fin at OG on my second day with one...never again!